I had IBS for 30 years and it had worsened over the years. - Oxford Biomedical Technologies, Inc. I had IBS for 30 years and it had worsened over the years. I had IBS for 30 years and it had worsened over the years. My findings with doctors and research was that it must be personal because people suffering had different symptoms. Exhausted with several health issues; I went on a mission to find the reasons that I broke out and my digestive system was in such a mess. Through a friend of a friend, I found out about Susan Gleaton and LEAP. The six month program was geared toward my personal blood work that exposed what my system did not like. I followed the program as close as I could and in 6 months my IBS was cured. Plus, I found out what rashes were from food. I highly recommend this program and I was right as it cannot be solved in a one size fits all mold. My biggest pleasure is being able to eat salad, popcorn and so many other foods that I can now enjoy without a trip to the bathroom. P.S. I drove an hour each way for Susan to direct me through the process. She was so caring and wonderful. 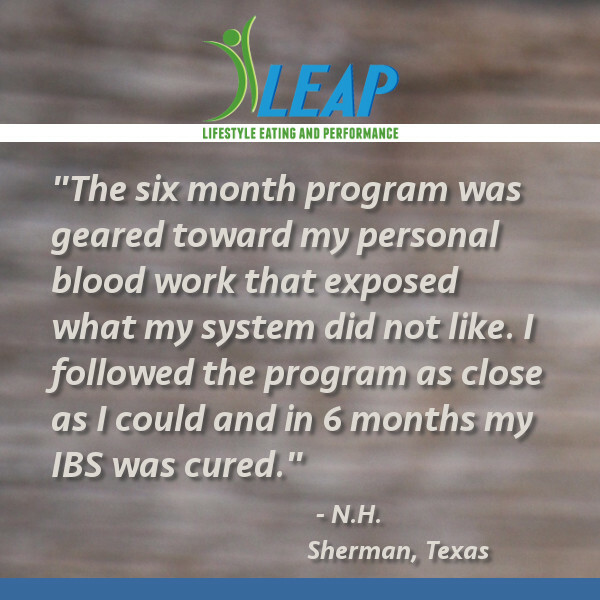 This is another beautiful success story from one of Susan Gleaton, Registered Dietitian and Certified LEAP Therapist, in Texas.